I had already spent months reading books about homeschooling. I had talked to a few homeschoolers. I had Attended a new homeschooler question and answer session at a local library where I met some homeschoolers and their kids. By this point in my decision I had even started telling people "I'm thinking of homeschooling in the fall"; tentatively at first and then with more confidence as no one shrieked "Are you crazy?" I was at that point where I was straddling the fence; ready to jump off but entirely terrified to do so. It's not easy to do something so totally outside the norm. Lucky for me I had a few family members who were already homeschooling and were cheering me on. I had support from my husband, his family, my family, even most of my friends were quite encouraging (a few joked that they wished I'd open a school and teach their kids too!). I am so lucky to have had such wonderful people in my life. I was teaching at our local school at the time; I was a substitute (one that reported just about daily) and I had many friends in the school system. They all assured me I would be great at it. 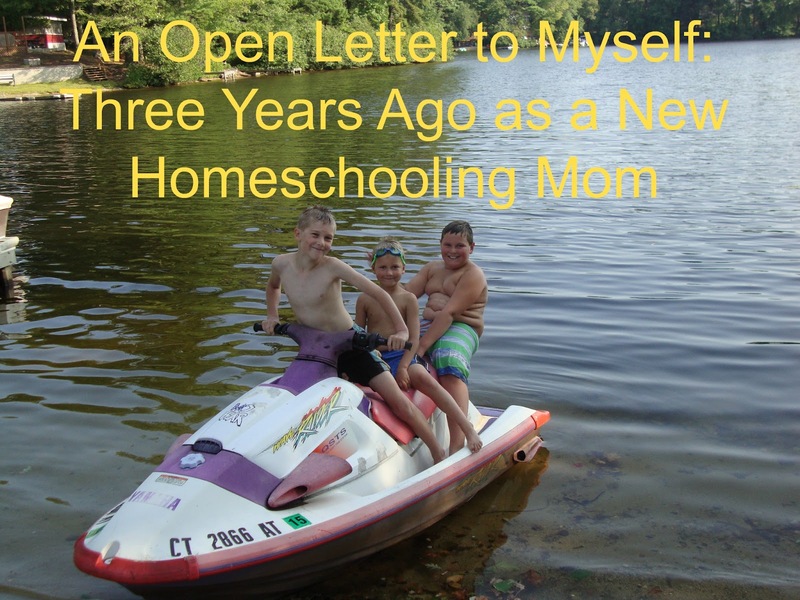 Still, I was hesitant to declare myself a homeschooler and make that final leap into... what?! That's what scared me. This was new and uncharted territory for me and I'm not one to like new things. Looking back one of the comments that meant more to me than others: one of the teachers at our school confided to me that she had homeschooled her kids through middle school and told me that I would not only be great at it but I was going to love it and so would my kids. At the time I had no idea how she could possibly know that but her words; the words of what was essentially a stranger, meant more to me than the words of my family at that point. Not because I didn't love and trust them but because I knew they loved and trusted me. Does that make sense? I knew they would support my decision and be my champions and I guess I worried that they would support me even if they thought I might be making a mistake. We finally decided to start small and just test drive homeschooling for the summer. If all went well we were going to continue it for one year and then re-evaluate. 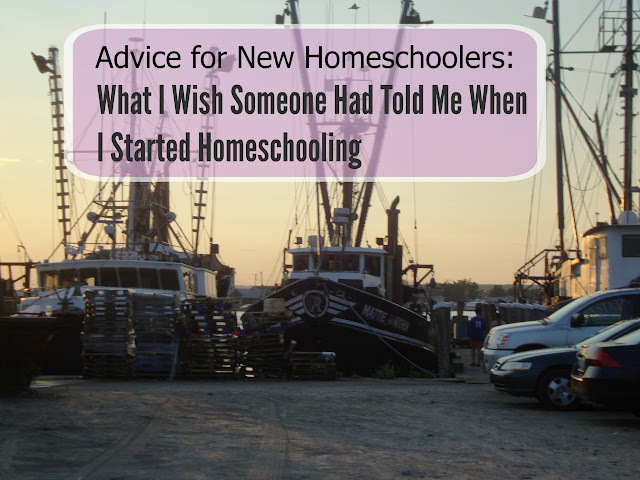 Looking back there is so much I wish I could have told myself... so I thought I'd share what I would say to myself (and most of this is what I say to new homeschoolers too; those that may still look a little shell- shocked at what they have done). There will be good days and bad. There will be countless smiles and some tears too (of joy and frustration and anger). There will be weeks where you think you've finally figured everything out; and then it will probably change. There will be days you want to quit and put them back in school; and then they'll probably ask to have a sleepover with each other since they're becoming such good friends (or something else that will totally melt your heart and make all your frustrations completely worth it). Homeschooling will challenge you and make you grow in ways you never thought possible. Homeschooling will change the entire way your family interacts and looks at life; but in a good way! There is SO MUCH good ahead. You really should not try to replicate what teachers do in the classroom in any way. Let the kids learn and other than suggesting some learning ideas and helping them answer any questions they have, let them be; at least at first. If you do replicate traditional classroom learning at home and you realize it's really a struggle to get through the days; change it up. Take a step back from what you are doing and ask the kids what they'd like to do. They'll probably want to just play for a while. They've spent years in a classroom sitting; they're sick of sitting. Let them play!! Let them and yourself take a break from all the traditional things you think of as learning and just watch them. It's OK to take a break; even a really long break. Think of months or even a year off not just a few weeks. You all need time to de-school and the general rule is one month for every year they've been in school; that means 3-5 months of de-schooling. Listen to them as they play; really, listen closely. Play really is the work of childhood and children teach themselves many things by playing. Go on outings; go hiking, go to the zoo, the beach, anywhere and everywhere you want to go. Meet up with other homeschoolers; it may take testing out a few different groups and it may take several different outings to make friends, but these other homeschoolers will be invaluable to you. Don't worry if all this playing and galavanting doesn't look like school yet; it will. Don't worry if it doesn't look like they are learning; they are! Talk to the kids, watch movies with them, read wonderful, enriching stories with them. Help them rediscover the joy in discovery and the "fun" in learning. Notice I said learning; learning and school are not the same and after 16+ years of being in school and 2+ years of teaching on and off you need to learn to separate what school looks like and what learning will look like for your kids. Try to hold yourself back from planning out the year and buying all sorts of curriculum books; you most likely won't follow or use hardly any of them. Try not to worry that they're taking too long to learn something or that they'll fall behind the "other" kids. It's not easy to let go of the ideas that all kids need to learn set pieces of curriculum at set ages. It's hard; really, really, hard. Try not to panic. All kids are different and learn different things at different times; even those public school kids don't all learn everything and master those subjects that are talked about. Just keep playing, talking, reading, and having fun. Homeschooling is a marathon; not a sprint. If you try to push them to cover all the same material they'd be doing in a traditional classroom and make them sit filling out worksheets or covering ALL of the subjects each day so you can cross them off your teacher to-do list you'll lose them. You'll all start to fight. You'll all start to cry and you'll start to think you made a big mistake. You'll start to question if you can really handle this whole homeschooling thing. BUT YOU CAN! You've got this! Parents are WONDERFUL teachers! It's OK to get scared that they might not be learning enough. It's OK to have a bad day or even a bad week (or two). But the sooner you learn to take a break when any assignment becomes to much for anyone and come back to it later the happier you'll all be. There will come a day when the kids will ASK you for some schooling/ learning ideas. Then they'll probably take off on their own again. There will come a day when you'll wake up and realize how much they've learned; in small little steps or in great giant leaps. You'll notice that even though you were watching them, and listening to them, you still may have missed just how deeply they've learned some new thing. That's real learning! Your kids are no longer learning material by skimming the surface to pass a test; they're learning about what they're passionate about and they are absorbing the information. They soak it all up like a sponge when they're interested, when they see the value in what they're learning and when it matters most to them. But just to let you know, you may not always see the value in what they're learning; that's OK too. Even if you can't understand why they're absorbed in learning all about Pokemon or Minecraft or anything else that seems like the opposite of school they'll relate it back to real life in ways you never thought possible! They'll surprise you when you think you're introducing them to a new topic and they'll already know it. You'll probably have no idea where they picked it up but kids are great like that. They're wired to learn. They WANT to learn all about the world around them. So let them, help them, facilitate learning. They'll teach you just as much as you're teaching them. You'll forge unimaginable bonds with one another. You'll wish you had started this journey much, much sooner. You'll lament the years they spent in public school when you missed knowing about their days and they just plain old missed you. You might feel guilty; but don't: All life experiences mold us in different ways and for the vast majority of it they really enjoyed school. But they, like you, were ready for change and their hearts are just as invested in this whole homeschooling thing too. They too want to see it work and they want to help you make it great. ASK them. You might think they're too little to help but they know what they want and what they like. You have watched your children grow and develop from birth. You know them best. You know what they like, what they fear, where their strengths lie and what makes them tick. You helped them learn to walk, talk, count, and feed themselves. You can teach them to read, add, subtract, multiply and divide. There will be doubts; you often doubt parenting decisions and wrestle with what is best. You will be doubting homeschooling decisions and wrestle with what is best. But the good will outweigh the bad. Boy oh boy, will that good ever outweigh the bad. When you need to make sure, you talk to other homeschooling moms. Tell them your fears and you'll be surprised that they have all felt that way at one time or another. Even those moms that seem like they are so super confident and have it all figured out will confide that they too have moments when they aren't sure they're doing the right thing. They'll help you put it into perspective and one day you'll be helping new homeschooling moms do the same thing. So for now, take it one day at a time. Focus on what they ARE doing, what they ARE learning and try not to worry about all that you'd like to cover by the time they leave home. You have many, many, many years to teach them what they need to know. Teach them to love learning and to seek knowledge and they'll teach themselves for years after you think you're done. You're going to love this new adventure more than you can imagine. Enjoy! They'll learn new things all the time; even if you're not the one teaching. All of my boys took a Microsoft coding class-- I know nothing about coding! What a great way to start as a homeschool mom! Writing this down is wonderful, and now you can look back on it and see where you started. 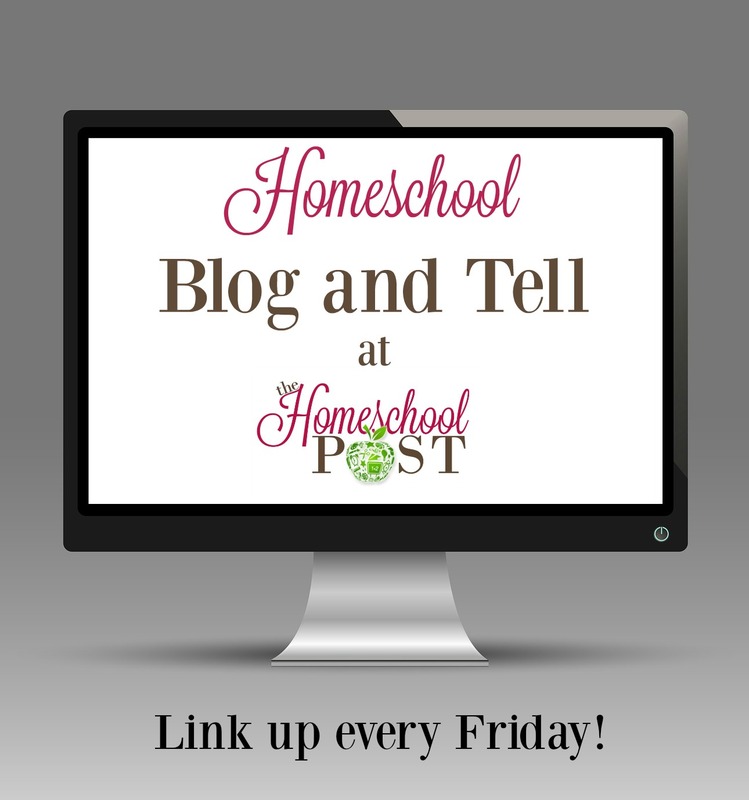 Thanks for linking up at Homeschool Memo Blog Hop!!!! Thanks for checking out my blog! I was so happy to find another link up party to join. What a great post for people considering this journey! Thanks so much for linking with us! Wow! You learned a lot in 3 years. Good for you for doing such a thorough assessment! Thank you! Luckily, I am a fast learner. I love this! Your more wise experienced self encouraging and answering all those lingering questions and fears you had when you were considering homeschooling. What an incredible way to encourage others that are at that jumping off point.